Redear Sunfish (Shellcrackers) strike like you owe them money. 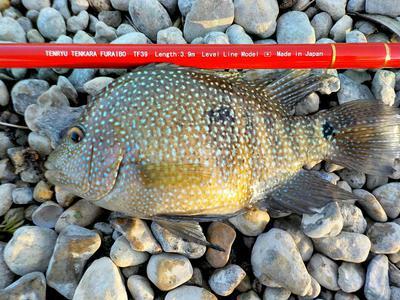 This 9-inch Green Sunfish put a serious bend in the Tenryu Furaibo TF39. Texas Cichlids (Rio Grande Perch) head for the bottom like they've swallowed an anvil. 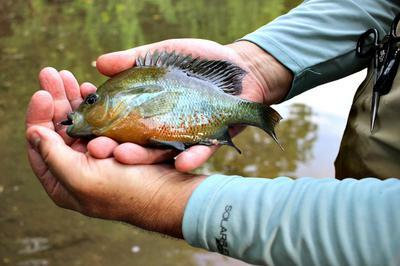 When nothing else will cooperate, Redbreast Sunfish (Yellow Bellies) will usually bite. But the truth is, the most common species caught in America, by tenkara methods or otherwise, are the many varieties of panfish. Whether you’re talking bluegill, redbreast, green sunfish, shellcracker, or Texas cichlid, these are the fish that have the greatest populations and the widest distributions. Also, most of these panfish eagerly take small nymphs, streamers, live, and preserved baits. How often would we have caught NO fish if it hadn’t been for sunfish? And can’t you just see the smile on a young angler’s face the first time he pulls a three-inch bluegill from the water? You would have thought that he’d just landed a tarpon or a tuna! Plus, many of these species are underestimated for their fighting ability. True, most of them are small, but if you’ve ever hooked a nine-inch bluegill or a one-pound cichlid in deeper water, you know exactly what I’m talking about. They turn their broad sides to the current and fight like Jack Dempsey. 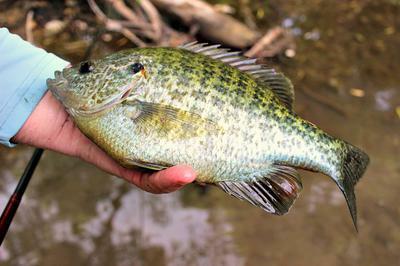 Often, we tend to lump panfish together, but each has its own characteristics. Shellcrackers (redears) and green sunfish slam a bait all at once, as if you owe them money. They’re sudden in their strikes and tenacious once hooked. Rio Grande Perch (Texas cichlids) often just “mouth” the bait, but—once they’re hooked—they head straight for the bottom like they’ve swallowed an anvil. Bluegills and yellow bellies vary a lot in how they take the bait and fight, but a big one will put a bend in your rod that you won’t soon forget. Some of my most memorable battles have been with oversized sunfish. It’s all about matching the rod to the fish. Which panfish is my favorite? If I had to pick one, it would be a large green sunfish. They have a fighter’s heart and a never-quit attitude that’s hard to beat. Study the second photo above and you can almost see the determination in that fish’s eye. When I finally landed that bruiser, he had a honey bee in his mouth that he’d swallowed. Now that’s a tough fish! So let’s appreciate and praise panfish for their fine qualities. Perhaps you’ve just received that new tenkara rod in the mail, and you’re thinking, “I have to go catch a fish with this pole right now!” What spot comes to mind? Often it will be that little fishing hole brimming with bream! We all know some spots like that, and aren’t we thankful for them? Our most common Panfish is the Crappie around here. We do treat them like Panfish, and keep many of the ones between 8 and 12 inches, letting the big boys and girls go. They are referred to as "freshwater halibut" in Idaho. It isn't uncommon to have an over 100 fish day in the spring. Last year I had an over 200 fish day, but only brought 20 home. If they aren't harvested they over populate and get stunted. The bite should be starting in the next couple of weeks. They are great fighters too, but care must be taken as one of their names is "paper mouths." If you horse them too much they will get off. I can't wait to catch some on my fixed rods. My favorite Panfish is the Pumpkinseed Sunfish. They are as colorful as many tropical saltwater fish. You're right--crappie are also hard to beat. They're mostly in our lakes, which I don't fish too much, as opposed to the creeks, streams, and smaller stretches of river that I frequent. I have caught a few, however, and they're great fun. I can't let this go without making a plug for my sister site, finesse-fishing.com. If you know people who are not yet fixed-line aficionados, the Shimano Soare BB Mebaru rod on the finesse-fishing > shop > spin > rods page is just ideal for crappies. For panfish that aren't papermouths, the Daiwa Gekkabijin on the same page is the most sensitive spinning rod you've ever fished. The Daiwa Iprimi rods are also great panfish rods. I spend most of my time trout fishing. But my 6yr old niece and I love fishing for panfish! We always have big smiles. And who cares if they are only 6-8". I use the Kurenai HM33R and it has great action on bluegill and crappie. It also does great on bass and trout. What I really like about it is the weight. Very light and durable. I don't know of many pastimes that are more enjoyable than fishing for panfish with a youngster. That reminds me that Chris Stewart is always writing that it's important to match the fish to the rod. On the right equipment, panfish are a wonderful challenge. Yep, it ain't all about Trout. A few weeks ago I pulled up more than 20 crappie and had a fish fry with my family that same day. Really nothing better !!!!!! I wonder why we "rate fish." Maybe it is our upbringing. I remember as a very young boy my grandfather getting upset when we fished the shallows for sunfish in the spring and someone would catch a "rock bass." I remember my Dad turning up his nose when one of us would reel in an eel pout. During my college years, I came to the realization that a rock bass puts up a great fight! I also discovered that they weren't too bad to eat as well. The same with the eel pout. One of the tastiest fish I have ever had! I think I got over my fish prejudices when I lived in Wisconsin and one of my fishing buddies took me Red Horse fishing. Target a sucker? I was pretty much over my childhood training, but going after Red Horse with Warren cleared the last vestiges of rating fish. The name "horse" applies. One of the most enjoyable days of fishing I have ever had. It is an amazing fish to fight on a rod and reel. One of my classmates in graduate school ranted and raved about how the steelhead was the ultimate fighting machine, and I have never fought such a fish. We went to the Wilson River on the coast of Oregon and I caught 3 steelhead on my first trip. They are great fighters, but my thought was, "John you have never caught a Northern Pike or Muskie on a fly rod!" Panfish on the right set-up can be fast, furious, and fun! I try to enjoy every fish I catch. My question now is, "Where is the closest fishing? ", so I can do it more often. That isn't to say that planning trips to target certain species isn't fun too. I have a grayling and golden trout trip planned this year. "The best fish is to one on the hook!" That is my motto! P.S. It really bothers me how carp are so hated in our area. I go to the lake or river and see them floating after they have been stuck by the bow fisherman. I then watch a video of English fisherman who check over their carp after catching them and apply first-aid before releasing them if needed. Enough said! By the way, Carp when prepared right are good eating. Had to throw in my 2 cents. My favorite of the panfish has to be either pumpkinseed/red ear, or greenies. They're both great especially on a tenkara rod. I target them specifically, depending on where I'm fishing. A big influence was a book called "The sunfishes" by Jack Ellis. If you haven't read it you should do so. Well, I found a used copy of that book for less than $5 online, so I'm all over that! I agree--large green and redear sunfish are worth targeting because they strike aggressively and fight extra hard. On the right tenkara rod, they'll give you all the fun you want. 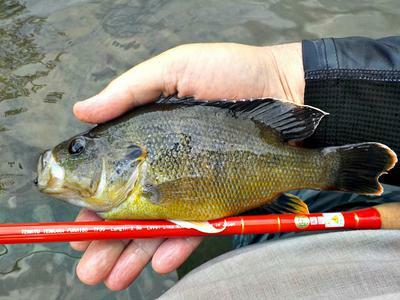 The redear sunfish in my photos was taken on a Nissin Zerosum 360, and the 9-inch green sunfish was landed on the Tenryu Furaibo TF39 in the photo. Both battles were memorable. Les, you're right on about "Where is the closest fishing." The closest very good trout stream (and even that gets too warm in hot weather) is 93 miles north. But there are several small rivers and a large river 10 to 30 minutes away teeming with panfish, bass, pike, catfish and even walleye, not to mention chubs, shiners and other sporty little fishes. Oops, I forgot suckers, including whites and several redhorse species. Whoops, there are carp and gars, too. Did I leave out lakes? Yup, lots of those close by, but lakes are a sometimes thing and I much prefer wading moving water with one of my keiryu rods. I dearly love those cool water streams and my little finny friends in them. Fortunately, they are mostly bordered by flood plain forests, which protect them from development. Long may they flow! Couldn't agree more with your post. I'm trapped in one of America's trout centers. Not that I'm complaining about that, but I sure miss the bluegill pond I grew up on. I have done three hour drives in search of them, ending up with some magnificent trout, but no bluegills. Finally, I found a golf course pond with a nice population. I was told it is private, but they are tolerant of a little fishing, just be discreet. My Nissin Pocket mini is the most discreet rod on earth. I just bike over, pull it out and cast a popper. The rod is a blast with a bluegill and I even caught a few bass. After years of searching, my fishing world is complete! My favorite is Green Sunfish / Bluegill hybrids. They are big, aggressive and tropical looking. Plus, they are a five minute walk from my house. I agree with Les that it's been too easy to fall into the fish rating game. I also fish his area -- carp, whitefish, etc. have all been referred to as "trash fish." I know of trout anglers that disparage anything but, and steelheaders that won't fish at all unless those monsters are running. Our local tailwater is typically 300-700 cps in the summer making for easy wading and a simple location to reach. Today I'm seeing it is raging at 9,500 + cps; definitely not wadable! I hadn't targeted warmer water fish since for over 4 decades. With my usual trout seams unavailable it has been amazingly refreshing to have fun again casting to these exciting warmer water varieties. And yes!!! With the right set-up they can be exciting indeed!! And don't forget. Panfish are excellent friends of the dinner table!! !